Susan felt very unsure of herself. And unsure of her jewelry. Would people like it? Was the color mix appropriate? Was the construction secure? Was the price smart and fair? She allowed all this uncertainty to affect her design work – she had difficulty finishing pieces she was working on, starting new projects, and getting her work out there. 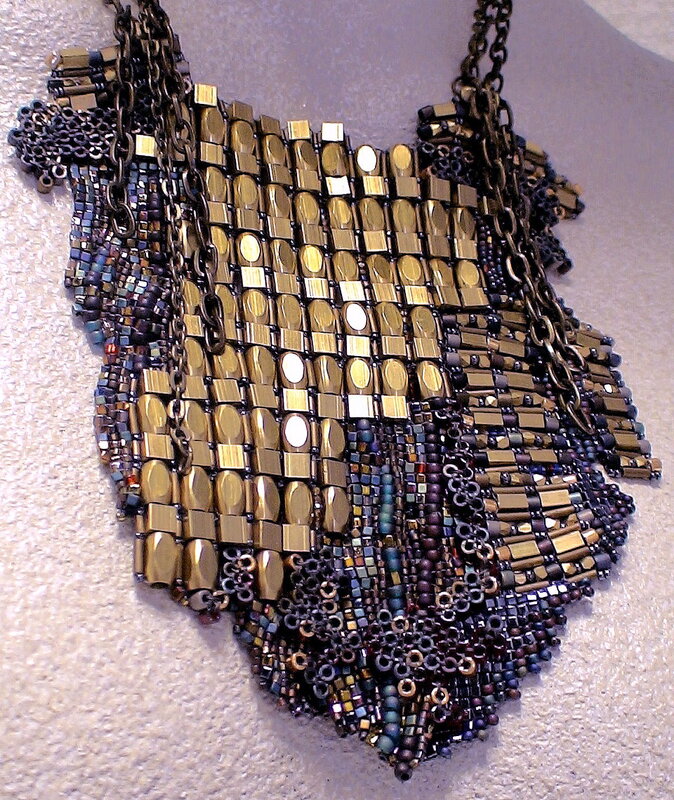 Like many of my jewelry and beadwork students, Susan needed to be empowered as a designer. Empowerment is about making choices. These choices could be as simple as whether to finish a piece or not. Or whether to begin a second piece. The designer will make choices about how to draw someone’s attention to the piece, or present the piece to a larger audience. She or he may decide to submit the piece to a magazine or contest. She or he may want to sell the piece and market it. The designer will make choices about how a piece might be worn, or who might wear it, or when it might be worn, in what context. And for all these choices, the jewelry designer might need to overcome a sense of fear, boredom, or resistance. The designer might need to overcome anxiety, a sense of giving up, having jeweler’s block, feeling unchallenged, and even laziness. 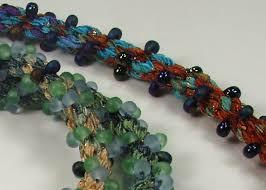 Question 1: Should BEADWORK and JEWELRY MAKING be considered ART or CRAFT? The jewelry designer confronts a world that is unsure whether jewelry is “craft” or “art.” This can get very confusing and unsettling. Each approach has its own separate ideas about how the designer should work, and how he or she should be judged. When defined as “craft,” jewelry is seen as something that anyone can do – no special powers are needed to be a jewelry designer. As “craft,” there is somewhat of a pejorative meaning — it’s looked down upon, thought of as something less than art. But as “craft,” we recognize the interplay of the artist’s hand with the piece and the storytelling underlying it. We honor the technical prowess. People love to bring art into their personal worlds, and the craftsperson offers them functional objects that have artistic sensibilities. When defined as “art,” jewelry is seen as something which transcends itself and its design. It evokes an emotional response from the viewer. It has more of a sense of clarity of purpose and choice, a sense of presence. As “jewelry art,” things done to improve functionality – durability, movement, drape and flow – should play no role at all, or as a compromise, merely be supplemental. How you define your work as ART or CRAFT will determine what skills you learn, how you apply them, and how you introduce your pieces to a wider audience. QUESTION 2: How do you decide what you want to create? What kinds of things do you do to translate your passions and inspirations into jewelry? What is your creative process? Applying yourself creatively can be fun at times, but scary at other times. It is work. There is an element of risk. You might not like what you end up doing. Your friends might not like it. Nor your family. You might not finish it. Or you might do it wrong. It may seem easier to go with someone else’s project. Set no boundaries and set no rules. Be free. Go with the flow. Don’t conform to expectations. Play. Pretend you’re a kid again. Have fun. Get the giggles. Experiment. Take the time to do a lot of What Ifs and Variations On A Theme and Trial and Error. Keep good records. Make good notes and sketches of what seems to work, and what seems to not work. Evaluate. Learn from your successes and mistakes. Figure out the Why did something work, and the Why Nots. QUESTION 3: What kinds of MATERIALS work well together, and which ones do not? I always suggest using the highest quality materials your budget will allow. Question 4: Beyond applying basic techniques, how does the Jewelry Designer evoke an emotional response to their jewelry? An artistic and well-designed piece of jewelry should evoke an emotional response. This takes both the successful application of techniques as well as skills. Unfortunately, beaders and jewelry makers focus too often on techniques and not often enough on skills. It is important to draw distinctions here. Techniques are necessary but not sufficient to get you there. You need skills. The classic analogy comparing techniques and skills references cutting bread with a knife. Technique: How to hold the knife relative to the bread in order to cut it. Skill: The force applied so that the bread gets cut successfully. QUESTION #5: When is enough enough? How does the jewelry artist know when the piece is done? Overdone? Or underdone? How do you edit? 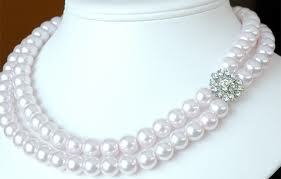 In the bead and jewelry arenas, you see piece after piece that is either over-embellished or under-done. Things may get too repetitive with the elements and materials. Or the pieces don’t feel that they are quite there yet. For every piece of jewelry there will be that point of parsimony, where adding or subtracting one more element will make the experiencing of the whole greater than the sum of its parts. 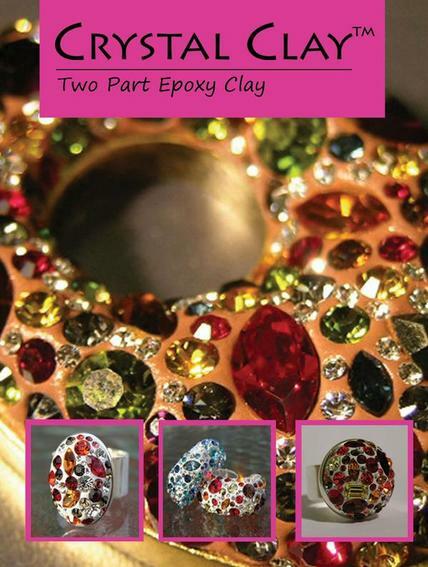 The empowered jewelry designer will have answers to these questions, though not every designer will have the same answers, nor is there one best answer. Yet it is unacceptable to avoid answering any of these 5 questions, for fear you might not like the answer. The empowered jewelry designer will have learned the skills for making good choices. These choices include making judgments about combining materials, both physical and aesthetic, into wearable art forms and adornment. This is jewelry making and design. 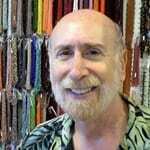 For Warren F., Jewelry Designer and teacher in Nashville, TN, beading and jewelry making endeavors have been wonderful adventures. These adventures, over the past 25 years, have taken Warren from the basics of bead stringing and bead weaving, to wire working and silver smithing, and onward to more complex jewelry designs which build on the strengths of a full range of technical skills and experiences. Learn more about Warren here! [Optional Kit available for puchase from instructor. QUESTION: Have you ever designed something truly ugly? 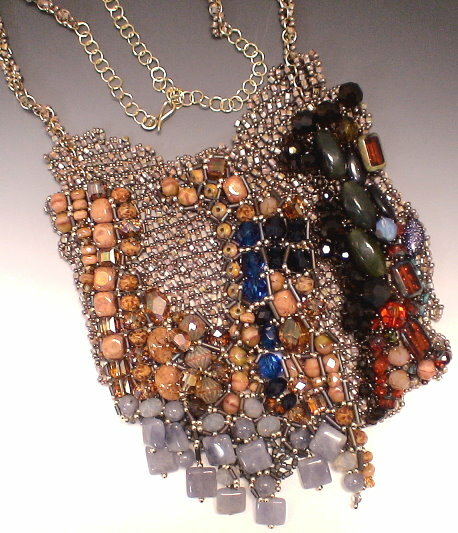 Look at some of the previous submitted entries to the Ugly Necklace Contest? In your view, and from a design sense, are there any particularly outstanding examples of “Ugly”? The UGLY NECKLACE CONTEST is a jewelry design contest with a twist. The contest presents a challenge not often tackled — at least intentionally. The contest draws the jewelry designer into an alternative universe where beautiful artists create ugly necklaces. It’s not easy to do. To achieve a truly hideous result means making the hard design choices, putting ourselves in situations and forcing us to make the kinds of choices we’re unfamiliar with, and taking us inside ourselves to places that we are somewhat scared about, and where we do not want to go. – Can I push myself to use more yellow than the purple warrants, and mix in some orange? – Can I make the piece off-sided or disorienting, or not have a clear beginning, middle or end? – Can I work with colors and materials and patterns and textures and placements and proportions I don’t like? – Can I design something I do not personally like, and perhaps am unwilling, to wear around my neck? – Can I create a piece of jewelry that represents some awful feeling, emotion or experience I’m uncomfortable with? – Can I make something I know that others won’t like, and may ridicule me for it? Because answering questions like these is not something people like to do, jewelry designers who attempt to achieve “Ugly,” have to have a lot of control and discipline to override, perhaps overcome, intuitive, internally integrated principles of artistic beauty. 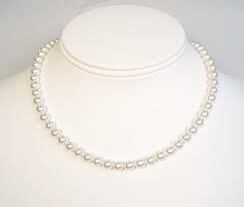 The best jewelry designers, therefore, will be those artists who can prove that they can design a truly Ugly Necklace. In our contest, we invite all those jewelry designers out there to give it a try. 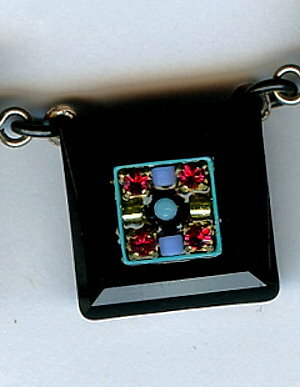 The Ugly Necklace Contest is one of the many programs at Be Dazzled Beads and The Center for Beadwork & Jewelry Arts in Nashville, Tennessee, that encourage beadwork and jewelry makers to challenge themselves and to test their design skills, and learn some fundamentals about jewelry design in the process. 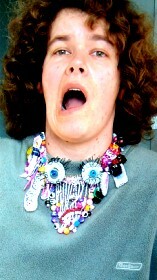 Different participants in The Ugly Necklace Contest have interpreted “Ugly” in different ways. Some focused on the ugliness of each individual component. Some used materials that they felt conveyed a sense of ugly, such as llama droppings, or felted matted dog hair, or rusty nails, or cigarette butts, or a banana peel. Some focused on mood and consciousness, and how certain configurations of pieces and colors evoked these moods or states of consciousness. Others focused on combining colors which don’t combine well. Still others focused on how the wearer’s own body would contribute to a sense of ugliness, when wearing the piece, such as the addition of a “Breast Pocket” which would lay just below the woman’s breast, or peacock feathers that covered the wearer’s mouth, or the irritating sounds of rusty cow bells, or the icky feeling of a rotting banana peel on the skin. Still others saw Ugly as a sense of psychological consciousness, such as being homeless, or an uncomfortable transition from adolescence to adulthood. 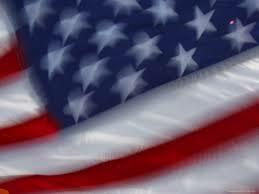 For some Ugly meant politically ugly, like Saddam Hussein of Iraq, or the trans-fats associated with fast foods. It is not enough just to string a bunch of ugly beads on a wire. 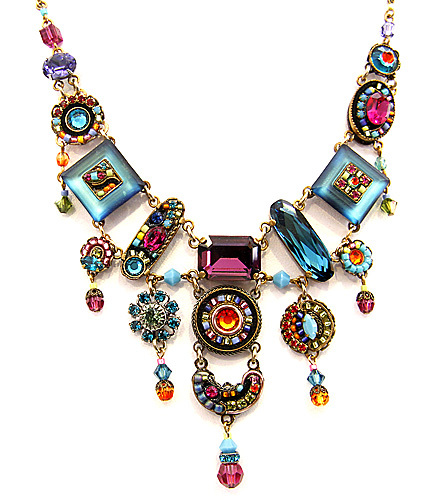 Ugly pieces do not necessarily result in an ugly necklace. 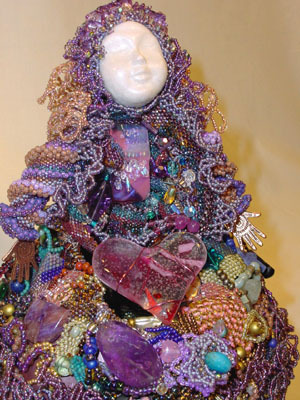 As one entrant learned, when she strung her ugly beads together, the final project was beautiful, and sold for $225.00, before she could enter it into the contest! Actually, if you look at many of the entries, you see that ugly pieces, once arranged and organized, don’t seem as ugly. Organization and arrangement contribute their own qualities and sense of beauty that transcends the ugly parts. Adding to the fun, the contestant also has to create a piece of jewelry which is functional and wearable. 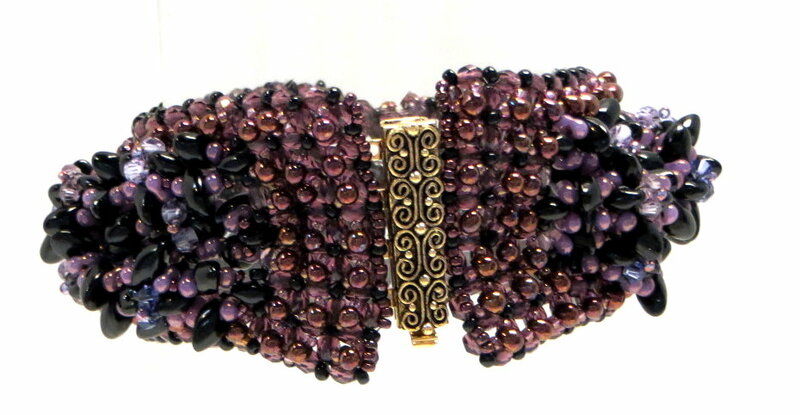 This is what sets beadwork and jewelry design apart from other design arts. A piece of jewelry as art, (even Ugly art), has to maintain its essence and purpose, even as the wearer moves, bends down, or rubs against things. Jewelry is Art as it is worn. Jewelry is not a subset of painting or a type of sculpture. Jewelry is something more. Jewelry is art and architecture in motion, often frenetic motion. The pieces that make it up, and the techniques and designs which coherently interrelate these pieces, must also anticipate this dynamic totality. Otherwise, the piece of jewelry becomes a failure not only as a piece of jewelry, but of art, as well. The Ugly Necklace Contest is an arena for budding and established beadwork and jewelry designers to strut their stuff – to show how adept they are at creating ugly-necklace-pieces-of-art. It’s a jewelry design competition with a twist. 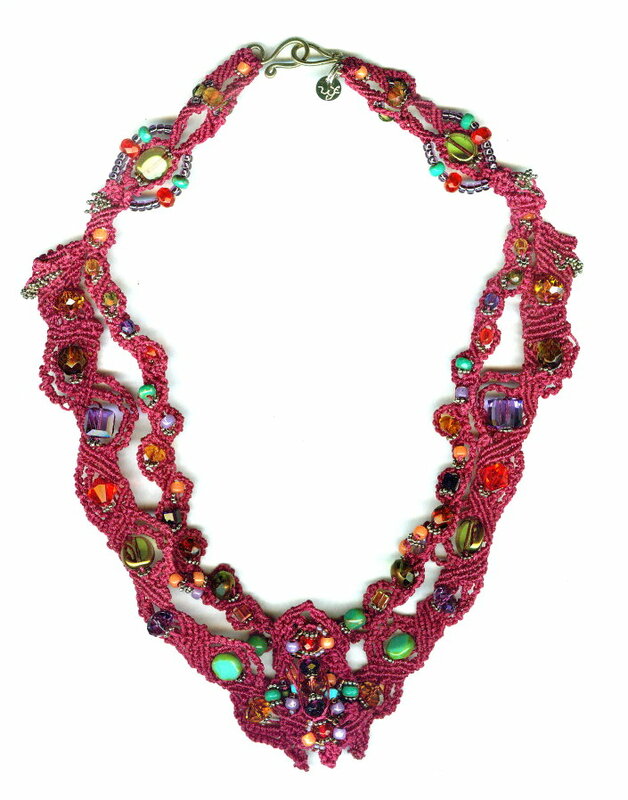 The finalists of The Ugly Necklace Contest are those beadwork and jewelry designers who can best elaborate upon rules of design, whether intuitively or strategically. 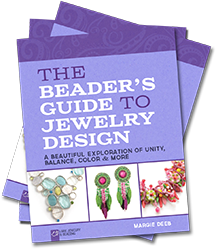 These rules of design are, in effect, an underlying grammar and vocabulary – the theoretical and professional basis of beadwork and jewelry making as art, not just craft. Once beaders have mastered the basics and enjoyed bringing others’ patterns to life, they’re ready and eager to take the next step: creating their own original pieces. Here, finally, is their must-have guidebook to the fundamental principles of visual design. 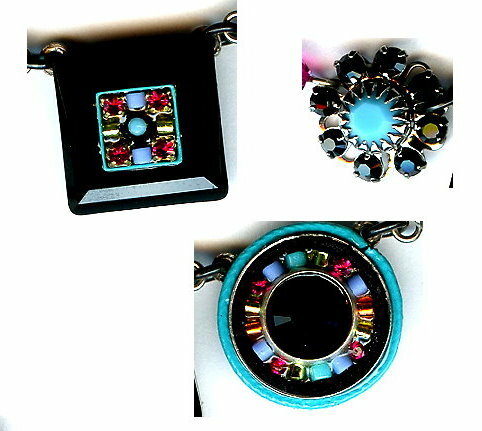 Focusing on jewelry, it helps beaders explore concepts such as unity, scale, proportion, balance, rhythm, volume, shape, pattern, texture, movement, drape, and color in their work. Exercises, reader challenges, and lavish photos enhance understanding and assure design success. This book is available for Pre-Order at Amazon.com. 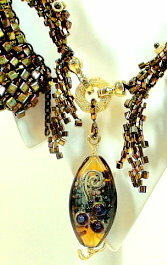 Jewelry Design is the application of basic principles of artistic expression. One set of principles involves COMPOSITION. 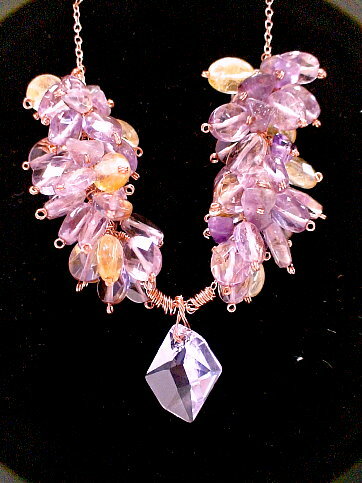 In an article online – Good Jewelry Design (http://www.landofodds.com/store/goodjewelrydesign.htm ) – I describe 10 Principles of Composition. Principles of Composition define what types of goals the good jewelry designer should achieve. Discussion on these principles and their application focus on what elements in our pieces we , as jewelry designers, manipulate in order to achieve a principled, satisfactory outcome. In this post, I focus on one in particular: Dimensionality. What kinds of things have you manipulated within your piece(s) that helps you achieve a satisfying sense of dimensionality? Conversely, where do you see failures in attempts to achieve “dimensionality”, and what kinds of wrong-way choices do you think the jewelry designer made, that might have led to this failure? What better choices could the designer have made? Share images, if you have them. Good Dimensionality refers to the degree to which, whether the piece is flat or 3-dimensional, the placement of objects (and their attributes) is satisfying, and does not compete or conflict with the dimensionality of the piece as a whole. Sometimes dimensionality is achieved through the positioning of masses of objects or planes of interconnected pieces, such as varying sizes/heights/lengths or layering or cut-aways, or varying positive and negative spaces. Othertimes, dimensionality is achieved through color/texture optical effects, such as the use of glossy and matte beads in the same piece, or mixing darker/more intense colors with light/less intense colors. How often have you seen something like a flat loomed bracelet and a button clasp, that sits so high on the bracelet, that it detracts from the 2-dimensional reason-for-being of the piece. Would a clasp, and a flatter clasp, at the end of the piece have worked better? Glossy surfaces move toward the viewer, and matte ones recede. Can you point to successful examples of this? Achieving Good Dimensionality is considered, not only a desirable design goal, but a critical and important characteristic of contemporary jewelry. This doesn’t mean we want to pile up bead up bead and layer upon layer. It means we want to show how creative we can be to achieve something more satisfying than flat and more satisfying than one-dimensional. We want to demonstrate more artistic control over line and plane. How do you handle the challenges of doing custom work? What lessons have you learned, that you might share with others? 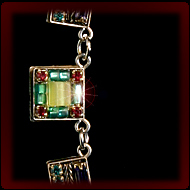 When I began my jewelry making career, one of the smartest things I did was take on repairs. I learned so much. 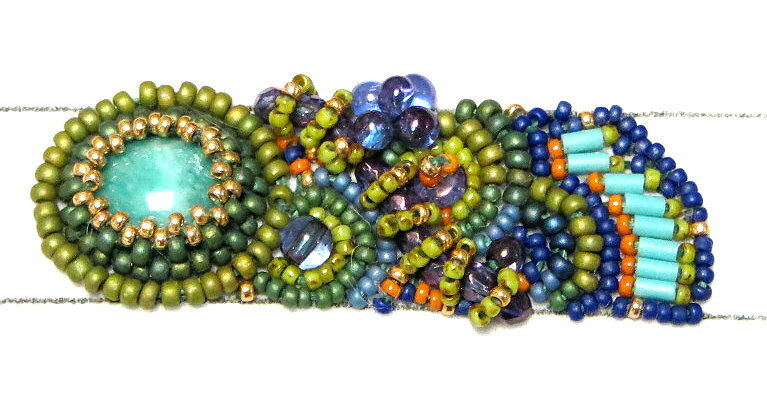 With each repair, I was able to re-construct in my mind the steps the jewelry designer made when creating this piece of jewelry – choices about stringing materials, clasps, beads, and how to connect everything up. And at the same time, I could see where these choices were inadequate. I could see where the piece broke or wore down. I could question the customer about how the piece was worn, and what happened when it broke. And with each repair, I gained more knowledge from yet another jewelry designer’s attempt to fashion a piece of jewelry. All these repairs resulted in more self-confidence about designing jewelry and designing jewelry for others. And it led to more custom work. 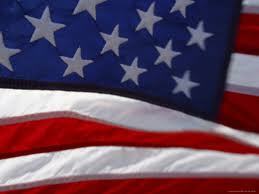 When you do custom work, I think you need an especially steeled personality to deal with everything that can go awry. First comes the fitting. You take some initial measurements, but after the piece is made, the perspective changes, and so do the desired measurements. Then comes a lot of customer indecision – colors, lengths, beads, silhouettes, overall design. Or they want to use several gemstones, but want them all to have the exact same markings and coloration. Not to mention the sometimes questionable taste. Or the possibilities of infringement of other jeweler’s designs, when the customer wants you to re-produce something they saw in a magazine or on-line. Identically. And then time-frame. Can I finish the piece by the time the customer wants it done? We discuss pricing, where many customers seem resistant to paying anything for my time. And last, payment. It’s not so easy to get some people to pay. I still do a lot of custom work. But I delay a bit, sitting down and actually constructing the piece. I have a lot of discussions with the client. If there are color or materials questions, I usually present the client for 3 colors or materials at a time, and ask them to choose which they prefer. Then another 3-at-a-time forced-choice exercise, until things get narrowed down. 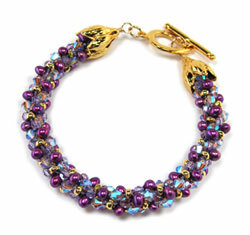 I photo-shop a lot of images – different colors, designs, beads – with the client, and get a lot of feedback. As I assemble all the information, I sketch/photo-shop what a final piece might look like. I superimpose this image on a mannequin to show the customer what it might look like. I have the customer formally sign-off on a final design. And only then, do I begin to construct the piece. I require a 50% deposit up front. I agree to make some adjustments for 6 months after the customer has the piece in hand. DOES TODAY’s WORLD AFFECT YOUR DESIGNS IN ANY WAY? I recently read an article about Paul Klee, a prominent modern artist in the early 1900’s. In 1914, in an interview, Klee noted that as the world became a scarier, less organized place, art became more and more abstract. That got me thinking. To what extent does the outside world affect my jewelry design decisions? 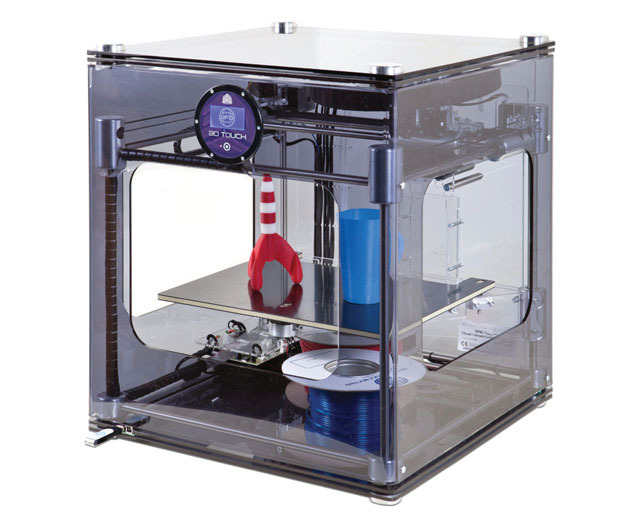 Has it changed my choice of materials? Colors? Patterns? Silhouettes? My initial thought, frankly, was not that much. Except that I began to think of the image I had of the “woman” wearing my jewelry and I definitely have a very feminist view of that “woman”. She’s empowered and self-assured. She plays both gender-specific as well as gender-neutral roles. And when I picture the contexts in which this “woman” will be wearing my piece, I picture the kinds of places an assured business woman would be, and how that woman would present herself. I also want most of my pieces to transition well between formal and informal settings, and with the woman wearing informal and more formal attire. I have difficulty designing for the traditional Southern woman. Or the woman who only wants something blue for a blue dress. Or the woman for whom jewelry plays a supplemental function, rather than a supporting role. 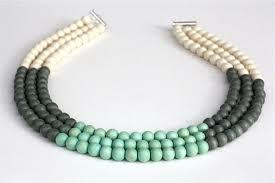 My jewelry tends to be very architectural, yet my color palette and its application is very impressionistic. An urban vs. rural Or modern vs. vintage tension always resonant in my pieces. I feel this thrust towards modernity that needs to be tempered by some kind of emotion, the roots of which I often find in vintage and ancient designs. So, there might be some of this outside world influence seeping into my design process. But I think for me, this jewelry design process is more often an escape from the realities of our world today. My pieces need to be powerful enough to allow my “woman” to escape these realities, as well. How about you? Does today’s world affect your designs in any way? GOOD JEWELRY DESIGN: Subjective or Objective? The Result of Subjective or Objective Choices? QUESTION: Can choices about jewelry design ever be truly objective? Or are they primarily subjective? 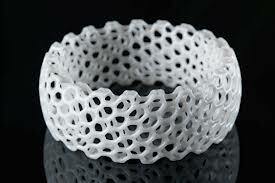 Is good jewelry design more a matter of “taste”, or is there some scientific basis which underlies it? Do you think there are “universal” rules and understandings that good jewelry designers would be wise to adopt, or is each and every designer on their own? I think, that if we observed and measured the jewelry design process, that much of it is very subjective, that is a matter of personal taste. Much appreciation of design and color and color combinations seems very subjective. People have certain social and cultural preset notions about what they prefer. Some people have a personal preference for browns, others for purples, and so forth. So people like a lot of fringe; others are minimalists. Psychologists have found that some people will like a color or combination of colors or design elements if arranged vertically. If arranged horizontally, they then don’t like them. And vice versa. Some people like things, when horizontally arranged, but dislike these same things when vertically arranged. People respond in very different ways to how design elements and colors, as well as shading, highlighting and tinting, are distributed throughout the piece. They might like the components, when distributed in a certain way, but dislike the piece, when the components are re-arranged and re-distributed. Some people get very excited when the colors or elements in their jewelry have very sharp boundaries and clear demarcations. Others hate this. They prefer a blurring or blending or smudging up of things. When confronted with a very monochromatic piece, or one with little rhythm, some people feel relieved, and others bored or anxious. Some people prefer pieces that exude a lot of power; others prefer their pieces subdued. As a designer, if things are mostly a matter of personal taste, style, and perspective, it gets more confusing about how to design things. What kinds of things should be included and which excluded? What strategies can you employ for choosing and combining colors and design elements? What things should you learn, if anything at all? Without proven, universal, objective, grammatical set of rules for using and combining things, how do we design things? How do we know which things are better, smarter and more satisfying, and which are not? Yet, as we page through the bead magazines, and click through the various jewelry-themed web-pages, I find that a lot of people agree on what is good, and what isn’t. On what is satisfying, and what isn’t. On what works, and what doesn’t. When there is a lot of agreement, perhaps, there are some universal understandings – OBJECTIVE rules – operating here. What might these be? Is Design purely subjective, or can you see some objective framework that may be at play, as well? I want to continue the discussion about Jewelry Design Principles of Composition with the principle I call “INTEREST”. Better designed and more satisfying jewelry has more Interest. The WHOLE will be GREATER THAN the SUM OF THE PARTS. Among the pieces you have made, can you think of examples you can share with the group, in which you made the ordinary…noteworthy? Can you think of examples, and share with the group, times where trying to make the ordinary…noteworthy did not work out well? Why do you think that was? In this same vein, can jewelry artists often try too hard to make the ordinary…noteworthy? Or not try hard enough? Have you visited stores – boutiques, department stores, galleries – in which everything seems too plain, uninteresting, boring? Too much like blue jewelry for a blue dress, without any distinction? What kinds of things can teachers do to encourage students to make the ordinary…noteworthy? 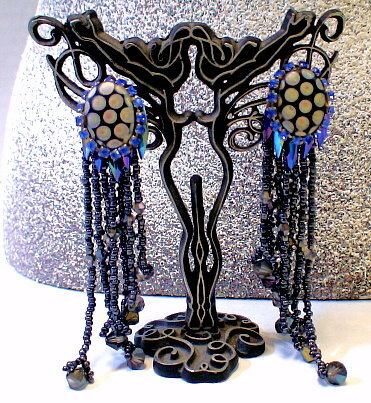 There’s a company called Firefly, and I have always been intrigued by their jewelry. It is made up of mosaic components they fashion themselves from things you might use every day. I’ve included some pictures of their pieces with this post. Their creativity is infinite. In one component, they take a Swarovski square donut and glue a back on it, typically a piece of metal which has been stamped or otherwise decorated, and has two holes or two rings near the top corners. 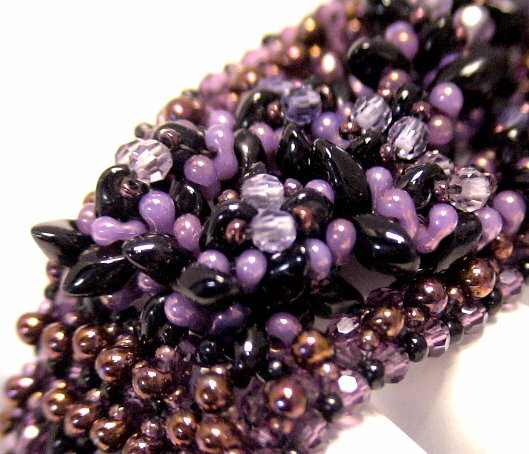 In the center of the donut, they might inlay some seed beads, some crystal beads, some colorful metal shards. In another piece, they do the same thing with a Swarovski ring donut. On the back of some bezel settings for drops they etch in words, like Spirit or Hope. They have beautiful and often unexpected combinations of colors in their pieces. Often a simple bead drop has that extra, “interesting” touch; it is not only a bead on a head pin, with a loop on one end. 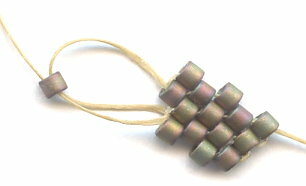 This bead would be set off by two small 15/0 seed beads, often of a contrasting color and finish. It is easy to get distracted. 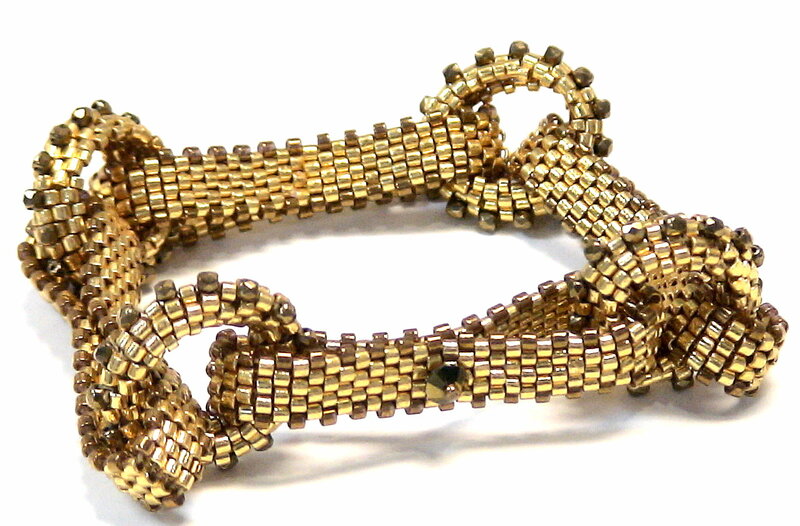 Dagmar sent me an email with a link to a picture of a bead woven piece she liked. At first, I reacted with some resistance, to click the link. I needed to finish up several projects, and didn’t want to cloud my thinking, or add one more image or one more pattern I liked, or color I liked, or technique I liked, to that mix of ideas and tasks and things swirling around and around in my head. But, you guessed it, I clicked. The piece was beautiful, intriguing, and l discovered many more of this artist’s work on display online. I spent time with each piece. I read the artist’s statement because I wanted to learn more about her inspiration. She had many embedded links in her statement. 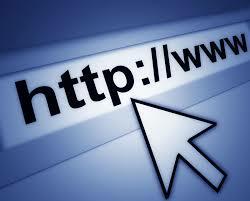 Which led me to many other websites. One concept was discussed, and I did a Google search on that. And then an images.google.com search on it as well. 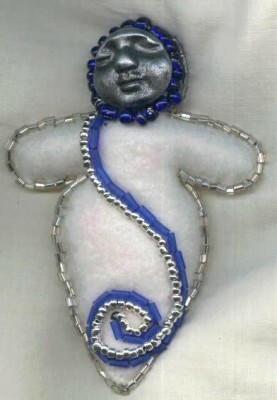 Which somehow got me over to Amazon, then Wikipedia, and over to some other bead artist’s website. Three hours later – how does time pass away so quickly? A simple click three hours earlier had led me through the looking glass and down the rabbit hole, through, what must have looked like to others, some torturous pathways, meeting all kinds of strangers. I am always working on several projects at a time. So in my head, are several sets of instructions, several color palettes, several understandings of inspiration. And I want to keep some focus. And I want to finish all of these projects. And I want to be able to conceptualize and invent my next projects, which involves lots of trial and error experimentation. I want to have the time and clear head space for all this. And yet, there are so many easily accessible distractions. And perhaps, I should phrase the question differently: Can you stay focused? Or, in the face of so many great examples of jewelry and bead art, so many evolving changes in styles and fashions, the introduction of many new colors and new bead shapes and new techniques – in the face of so much wonderfully inspiring, so many things to learn and educate yourself about – how do you keep in touch with your inner designer self, and find the time and energy for self-expression?